Ready, Steady, Slow..... Is your mobile app ready to perform? Ready, Steady, Slow..... Is your mobile app ready to perform? Better Mobile Performance Testing with HP Software and Shunra. Does your mobile app live up to user expectations? How do you know what your mobile user experience will be before you deploy? End users expect applications to perform as well or better on their mobile devices. They do not necessarily consider the inherent constraints presented by mobile networks, yet latency, bandwidth limitations, packet loss and jitter all affect the end user experience. By capturing and virtualising real mobile network conditions, performance tests yield reliable results that quickly point to remediation and optimisation efforts that can be tested and validated to optimize end user experience. Join us on this session to learn how to leverage HP Software and Shunra to capture real-world network conditions and virtualise those conditions within the lab in order to create a reliable test environment. 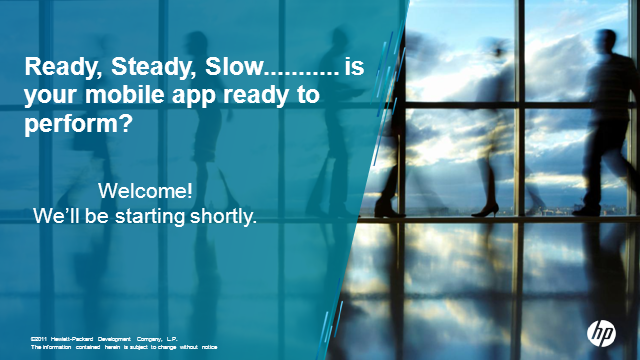 Title: Ready, Steady, Slow..... Is your mobile app ready to perform?